I started the fabric selection with some half yards of Aneela Hoey's newest line called Foxglove. 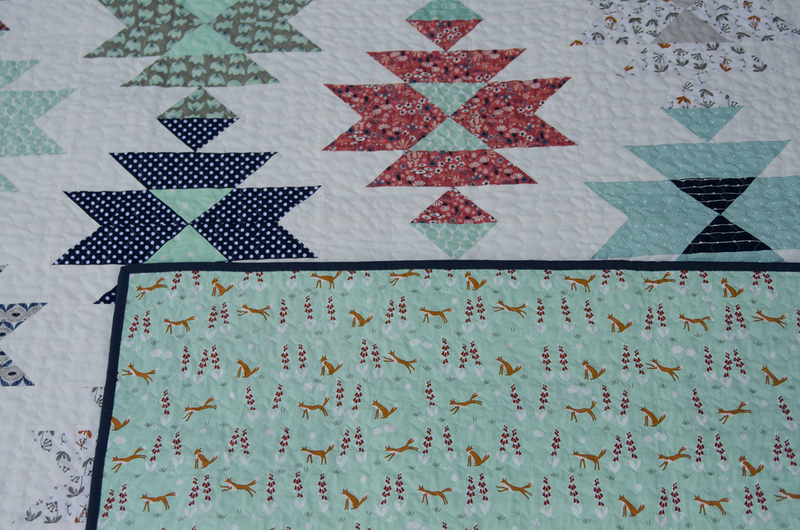 And as you can probably guess I added my touch with some coordinating prints and solids from my stash. The machine quilting was done using the Serpentine Stitch #4 on my Bernina. I always love the way it looks and the long vertical lines about an inch apart seemed perfect for this design. I adjusted the length and width to make it pretty zig-zaggy this time and love how it turned out. 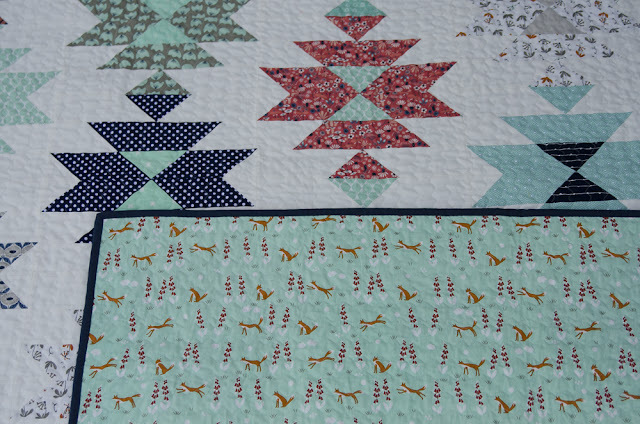 For the backing I chose the aqua print with the foxes from the line. It's so adorable!! As far as a pattern is concerned, I searched the web and found 2 really good ones. 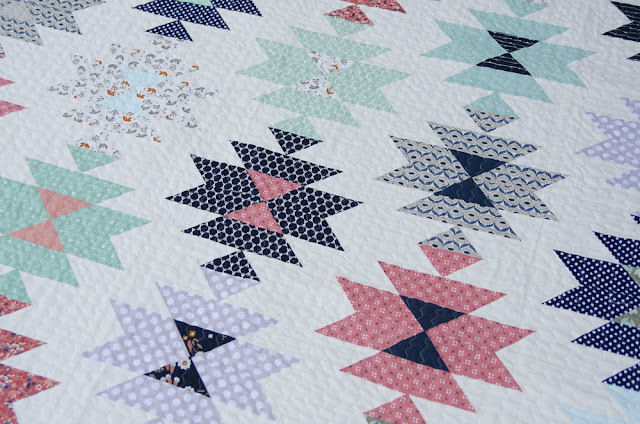 One from Holly Gets Quilty and the second from Tales of Cloth. Both are very good, but break the trapezoids into squares and triangles. I wanted to recreate the same block with fewer seams and came up with my own version. The trapezoids are cut by cutting a rectangle and using the 45 degree line on your ruler to trim the end or ends. Note that when only one end is trimmed, you'll need mirror images of each piece. If you place 2 layers wrong sides together and cut them together, you'll get the mirror image of each shape. Sewing: Refer to the block diagram above. 1. Use the 4 - 2 1/2" background squares and draw a line from corner to corner on the wrong side. 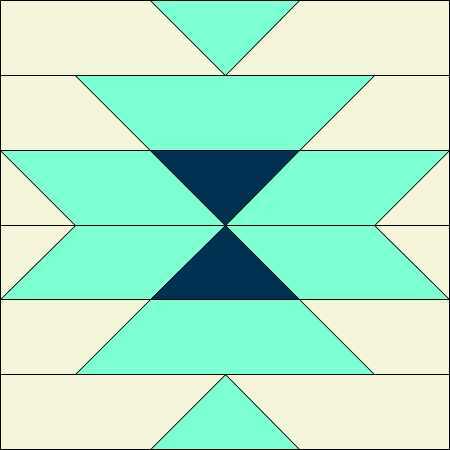 Place a marked square on the square end of each of the 2 1/2" x 6 7/8" main fabric (aqua) trapezoids with the drawn line going parallel to the 45 degree angle on the opposite end. 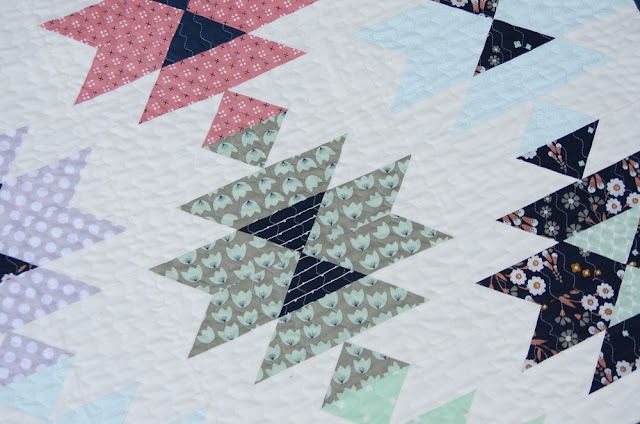 Sew on the drawn line, press and trim seam allowance to 1/4". (Use the 2 center rows of the block diagram for reference). 2. Lay out the units from step one and the remaining pieces following the above diagram. 3. Sew the pieces into rows. 4. Sew the rows together to complete the block. Tip! 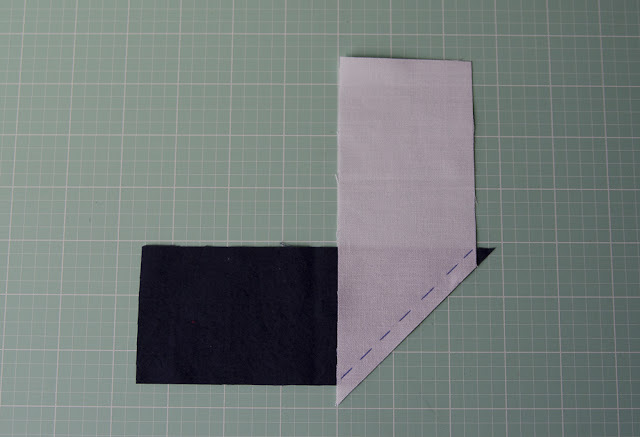 You'll be sewing 2 - 45 degree angles together. To line them up properly, use the photo below for reference. The sewing line should fall in the "V" created by the 2 angles. Great tutorial, I'm definitely giving this a go! This is really a cute adorable block! I love it! Shoot. 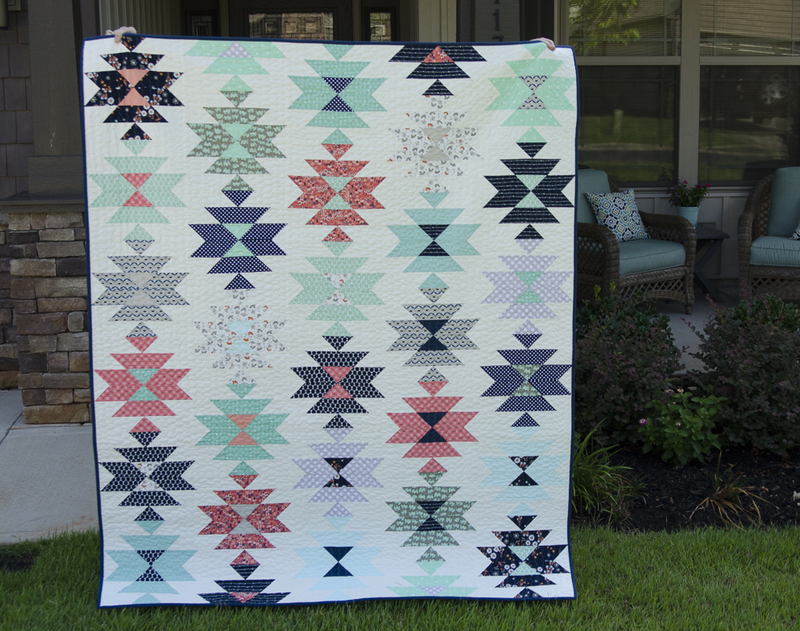 I already have so many projects on the back burner, but I REALLY like your quilt. You are an enabler, don't cha know! Giving us the directions and leaving no excuse not to do this . . . thanks! 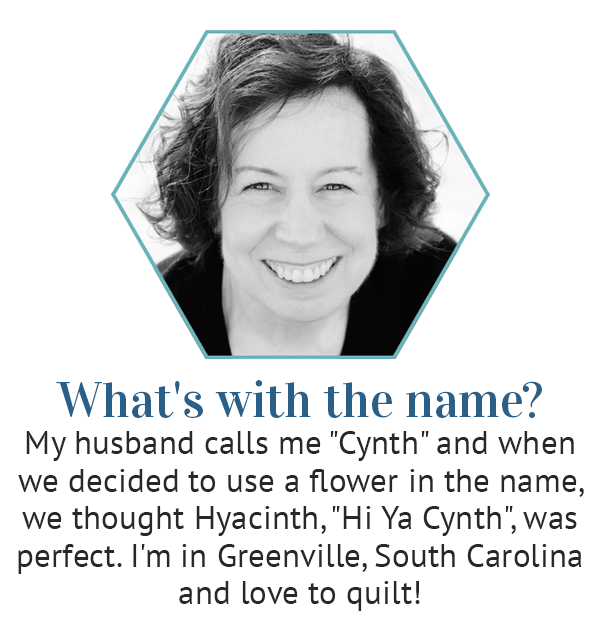 Cindy, I loved seeing this in person! It's beautiful! I'm always looking at patterns and figuring out ways to eliminate seams. Would love to know the adjustments to stitch #4 to achieve your results. Thank you for the tutorial! I am going to increase the size by 3x and try it for a one block quilt! Thanks so much for taking time to comment!